North Carolina Republican Rep. Walter Jones died in Greenville on Sunday, weeks after he entered hospice care. He died on his 76th birthday. “Congressman Jones was a man of the people. With a kind heart and the courage of his convictions, he dedicated his life to serving his Savior and to standing up for Americans who needed a voice. He was a champion for our men and women in uniform and their families, always mindful of their service and sacrifice,” his office said in a Facebook post Sunday. “Congressman Jones will long be remembered for his honesty, faith and integrity. He was never afraid to take a principled stand. He was known for his independence, and widely admired across the political spectrum. Some may not have agreed with him, but all recognized that he did what he thought was right. He will be sorely missed,” the post said. Several politicians took to Twitter to offer their condolences. “Deeply saddened by the passing of Walter Jones — a beloved colleague and friend who had a profound impact on all through his graciousness, character, and committed Christian faith. God be with and keep his family. We will miss him,” Rep. Mark Meadows tweeted. "I am deeply saddened by the passing of a long time leader, proud North Carolinian, a devoted family man of deep faith, and my friend of over forty years- Congressman Walter B. Jones, Jr,” North Carolina Democrat Rep. G.K. Butterfield tweeted. Jones broke his hip at his home on Jan.14 and underwent a surgery the following day. A week later, he was taken to hospice care after his health deteriorated. 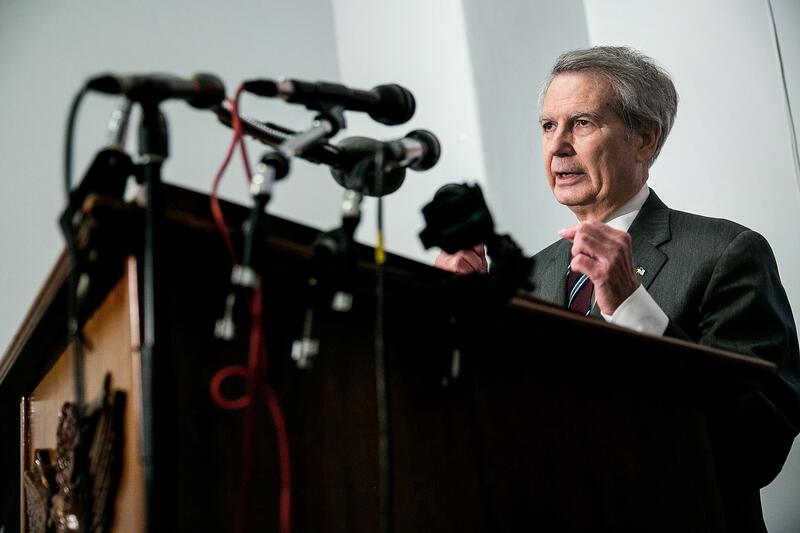 "Congressman Walter B. Jones’ (NC-3) health has declined after sustaining a broken hip last week. He is now in hospice care. The family asks for your prayers, and for their privacy to be respected during this difficult time,” a statement released on his official congressional website said at the time. Jones, who was first elected to the House of Representatives in 1995, was at one point a vocal supporter of the 2003 invasion of Iraq. He, however, regretted it later and not only wrote to the families of the U.S. service members killed in Iraq and Afghanistan but also joined with anti-war opponents in trying to bring troops home. "I have signed over 12,000 letters to families and extended families who've lost loved ones in the Iraq and Afghanistan wars, and that was for me asking God to forgive me for my mistake," he said in 2017. Rhode Island Democratic Rep. David Cicilline tweeted Sunday, "Walter Jones was a thoughtful, devoted legislator who always did what he felt was right. I was especially proud to work with him to push for bringing our troops home from Afghanistan. He will be deeply missed."